Bright Harvest offers a somewhat unique solar site survey. They use aerial photos of your house to build a digital model, and then show you alternative arrangements of collectors. They also model any shading objects near your home, and show the monthly and yearly effect of this shading on the output of the array. Estimates for yearly output are also shown. Overview of the model and panel layout with shading. They offered to do a survey of my house, and I took them up on this and the link at the bottom of this post is to a page with the details on the survey and some thoughts on it. In a nutshell, I was favorably impressed by the survey. 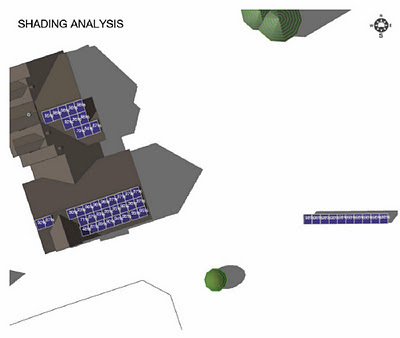 They did a good job of identifying potential PV array placements and a good job of finding shading sources. Even though I've done a couple "manual" solar site surveys on my home myself, they found some things that I had missed or not thought about. The cost of the survey is not trivial at $150, but it may well be worth it to get a good handle on shading -- especially for complex situations. I would always recommend doing the "manual" solar site survey yourself, as it will make you aware of how the sun interacts with the house and shading objects over the course of the year -- its just something everyone should do before tackling any solar project. But, if you are uncertain about the shading situation or array mounting possibilities after the manual survey, the Bright Harvest survey or a SketchUp model would be a very good follow up. I get a lot of emails from people who put their collectors up, and then come to find that the shading situation is worse than they thought -- it is just very important to have a good handle on shading before starting. So what does the survey of your house look like? There is a link to the pdf for the full report for my house at the link above.